How about this weather? It's 77 without a cloud in the sky here in Connecticut today and it looks like it will be just as beautiful tomorrow. It feels like SUMMER! After a pretty dismal Spring it feels so good to say that. It's amazing how much my mood shifts when the weather cooperates- the kids as well! They are so much happier when we get to roam around outdoors. Speaking of being outdoors, this weather has me craving backyard BBQs on the patio and this look is absolutely perfect for it. 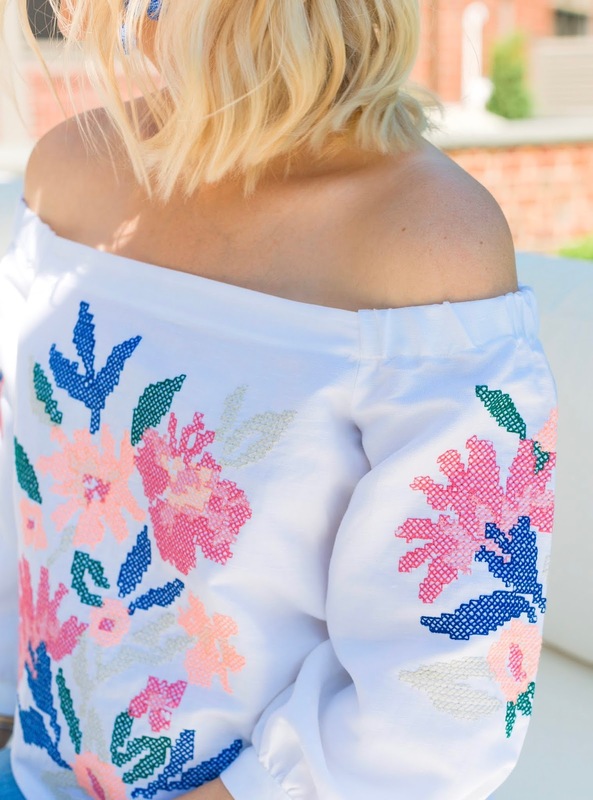 I love a good off the shoulder top and this one from Ann Taylor does not disappoint. It has beautiful embroidery and is made of a linen and cotton combo. It has summery-boho feel to it and with it's relaxed fit there is plenty of room for a baby bump! Best part is, it's under $100 BUT today it's 40% off making it $58.80! Ann Taylor is having a sitewide sale with 40% off your entire purchase with code SOREADY. Not only is my top 40% off but so are my sandals, earrings and sunglasses. The shoes are such an easy summer slide and I love the blush color with the studded detail. 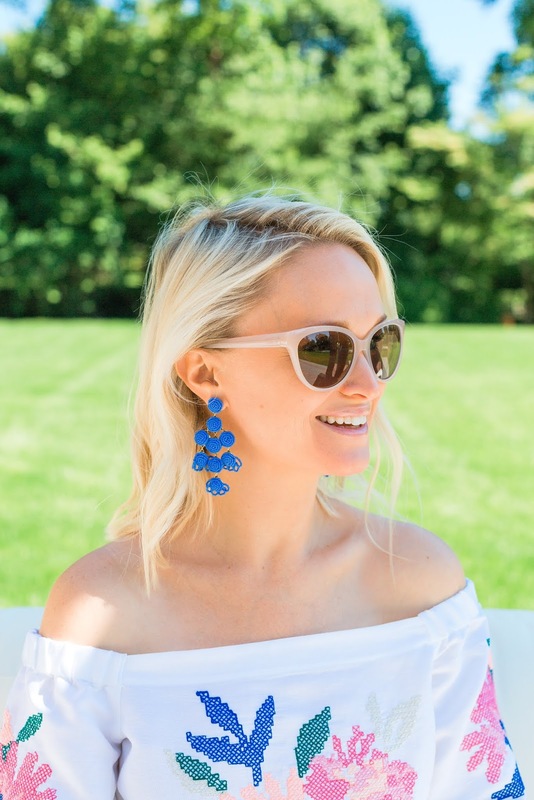 My statement earrings are the prettiest shade of blue and remind me of all the beautiful hydrangea on Nantucket. They are really lightweight and also come in a vibrant orange. With 40% off they come to about $41. Last but not least, my sunglasses. I have been wanting to venture away from my usual Le Specs and Ray-Ban sunnies and try a fun shape. I saw these cat eye pair in store and loved them when I put them on. I love the shape but especially love the neutral color of the frames. So fun for summer! These pants aren't included in today's post but I HAVE to share them with you. They are my absolute favorite pants ever. I have them in navy but tried them on in the white clay color in store and they are amazing. Unfortunately they didn't have the white clay in petite in store and since I'm vertically challenged, the regular sizes were just too long on me. I'm ordering the white clay pair in petite as we speak! This style comes in five colors! Another favorite:: these shoes! I now own them in both the blush and the chestnut color and they are seriously the most comfortable shoes ever. I ordered half a size down and love them! There are so many good sales going on this weekend and I'm going to do my best to keep you all up to date on some of my favorites. I'll start a post tomorrow and continue to update it when a good sale pops up! 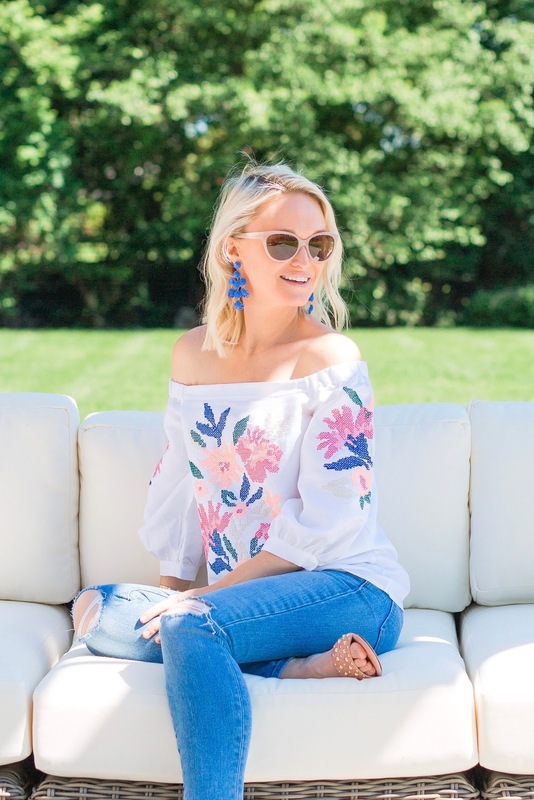 For now, shop some of my favorite pieces included in the Ann Taylor sale at the bottom of this post!